The Pakistani parliament is becoming increasingly radicalized -- as the results of a local by-election in Lahore in September demonstrated. In such a political climate, and with a new prime minister who refuses to criticize his country's blasphemy laws, let alone work to repeal them, Pakistan's already fragile "democracy" is on a steady slide backwards. 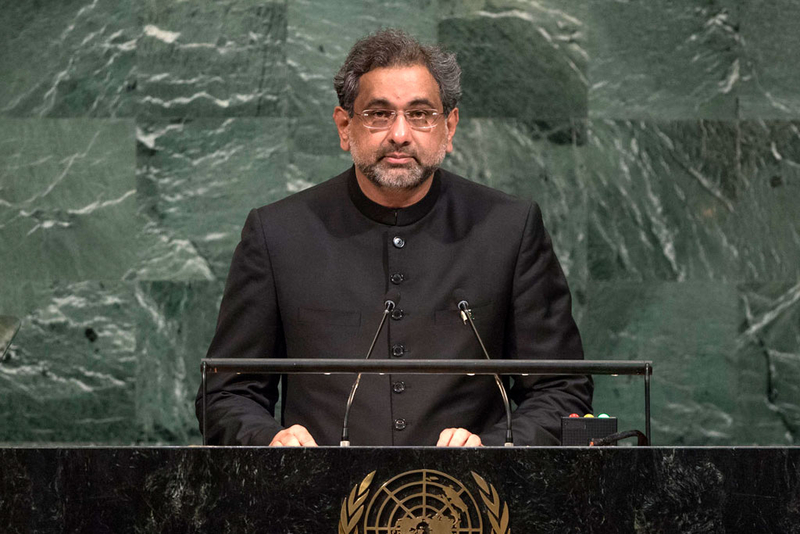 In late September -- less than three weeks after newly instated Pakistani Prime Minister Shahid Khaqan Abbasi attended the 72nd session of the UN General Assembly in New York -- two Christian boys employed as cleaners at a hospital in Pakistan were arrested for violating the country's blasphemy laws. According to the complaint lodged with police, the boys had swept up and burned strewn pieces of paper on which Quranic verses happened to be written. At around the same time, a Pakistani court sentenced a Christian man to death for insulting the Islamic Prophet Muhammad in a poem he sent to a Muslim friend on the WhatsApp messaging service. This came two months after a young Muslim Pakistani was sentenced to death for "blasphemous" posts on Facebook. On September 20, after the closing of the General Assembly, Abbasi was invited to give a talk at the Council on Foreign Relations. During the Q&A period -- at the end of his "conversation" with David Sanger of the New York Times -- he was asked by Human Rights Watch (HRW) director Kenneth Roth whether he would "speak out against [Pakistan's] blasphemy law, and certainly about [its] harsh application...with death sentences and mob violence and the like." "[I]t's only up to the parliament to amend the laws. The job of the government is to make sure that the laws are not abused and innocent people are not prosecuted or prosecuted." "[C]ertainly it is up to the parliament, but you're in a position of both great political and moral leadership now in your post as prime minister. And I think the core of the question was whether or not the leaders of Pakistan are willing to go stand up to what seems to be, at least through American and Western eyes at time(s), death sentences for what would clearly be protected speech in much of the rest of the world." "Well, I cannot comment on what is the law of the country. As I said, the only amendment that can happen to that law can be done by the parliament, and there are two houses to the parliament." The problem with this approach is that it is at best disingenuous. In fact, the Pakistani Parliament is becoming increasingly radicalized -- as the results of a local by-election in Lahore in September demonstrated. For example, although the extremist group, the Milli Muslim League, is not recognized as a party in Pakistan, the candidate it backed in the election -- Yaqoob Sheikh, designated as a terrorist by the US Treasury in 2012 -- garnered 5% of the vote for the National Assembly seat vacated by recently ousted Prime Minister Nawaz Sharif. An additional 6% went to a new Islamist party, Tehreek-e-Labaik Pakistan (TLP) whose objective is to turn the country into an entity governed by Sharia [Islamic] law -- and which puts all "blasphemers" to death. The TLP was founded in Karachi on August 1, 2015, but came into the public eye some months later, on the day that Mumtaz Qadri, the security guard who murdered Punjab Governor Salmaan Taseer -- a vocal opponent of blasphemy laws -- was executed for his crime. What about Bangladesh's Blasphemy Laws. Couple of days ago Bangladesh police arrested a 25-year-old social media activist as he tried to leave the country on charges that he defamed Islam and the Prophet Mohammed, authorities said Tuesday. If convicted, he will be sentenced to 15 years imprisonment.